Paul Hunter has lent a hand where it was needed-whether as teacher, performer, grassroots arts activist, worker on the land, or shade-tree mechanic. For the past 14 years he has published fine letterpress poetry under the imprint of Wood Works, currently including 24 books and 60 broadsides. His poems have appeared in Alaska Fisherman's Journal, Beloit Poetry Journal, Bloomsbury Review, Iowa Review, North American Review, Poetry, Poetry Northwest, Prairie Schooner, Raven Chronicles, The Small Farmer's Journal, The Southern Review and Spoon River Poetry Review, as well as in five full-length books and three chapbooks. 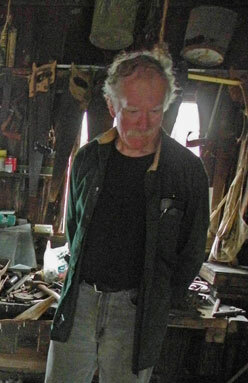 His first collection of farming poems, Breaking Ground, 2004, from Silverfish Review Press, was reviewed in the New York Times, the Home News Tribune, the Small Farmer's Journal, the Raven Chronicles, and was a recipient of the 2004 Washington State Book Award. A second volume of farming poems, Ripening, was published in 2007, and a third companion volume, Come the Harvest, appeared in 2008. He was recently a featured poet on The News Hour with Jim Lehrer. Broadside created by Paul Hunter/Wood Works Press for the poet’s reading for Counterbalance Poetry on Friday, October 3, 2008. Printed from hand-set metal type on archival paper with original woodcut. Limited to 275 copies.